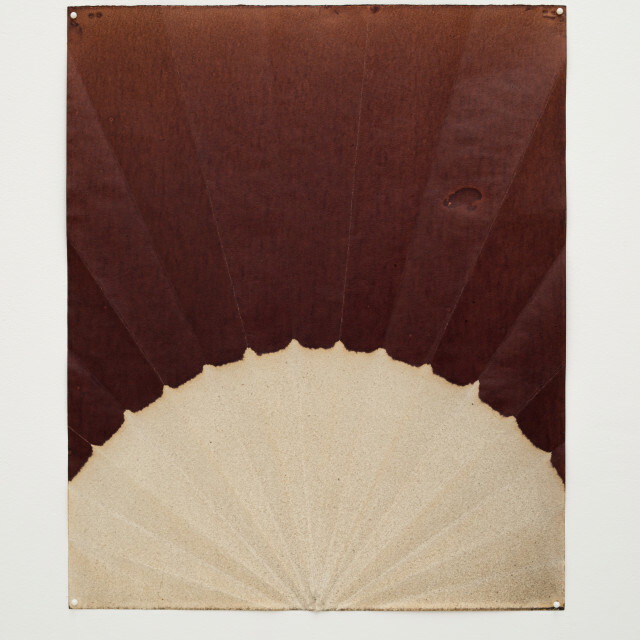 Kristof De Clercq gallery is delighted to announce the first solo exhibition by Jeff McMillan in Belgium. Jeff McMillan was born in Lubbock, Texas in 1968. He studied fine arts at universities in Texas and Alabama before moving to the U.K in 1998. His work approaches painting through materiality and process, often in dialogue with the found object. The exhibition Dark Parade includes paintings from the series Biblio, a selection of works on paper made using a library of formative books the artist shipped from America to the U.K. in the late 1990s, largely monographs of influential Twentieth Century painters. McMillan wraps each carefully selected book in paper before dipping it in ink or oil paint to create each new work. In a new untitled series of works on paper the artist employs simple methods of folding and submerging paper into ink that is both accumulative and subtractive and renders recurring pictorial forms the artist likens to furrows, horizons, rays, and stars. In the works on linen Half-truths, the stretcher frame itself is dipped in acrylic ink to its natural meridian lines to accrue increasing veils of colour. McMillan has exhibited in the U.K. and internationally. Group exhibitions includeFading Away, 22,48m2, Paris; 250th Summer Exhibition, Royal Academy, London (2018); Five Easy Pieces, Large Glass, London (2017); Found, The Foundling Museum, London (2016); ABJAD, Ingleby Gallery, Edinburgh (2015); six memos for the next…, Magazin4 Bregenzer Kunstverein, Bregenz (2013); Boule to Braid: Curated by Richard Wentworth, Lisson Gallery, London (2009); and the John Moores Painting Prize (2002, 2004, 2006). Exhibitions curated by McMillan include Tell it Slant at Frith Street Gallery, London (2016) and I AR YOU: Portraits by Self-Taught American Artists at Large Glass, London (2013). He was co-curator of British Folk Art at Tate Britain in 2014.